The Innovation Studio exists to foster interprofessional collaboration in creating healthcare solutions. If you have an idea for a healthcare product, service or software and would like help developing it into a commercial reality, we have resources, mentors and tools to help. Don’t have an idea? Come share your knowledge, network and partner up with a team that needs your support. 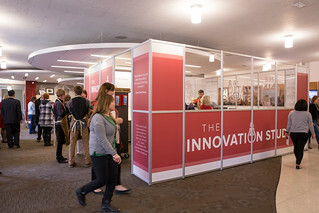 The Innovation Studio is a unique, moveable maker space that travels from college to college across campus, staying at each location for about two months to help foster interprofessional collaboration. Besides housing an array of prototyping tools, the Innovation Studio hosts workshops with topics such as product design, pitch development, interprofessional collaboration and maker skills, and provides project mentors, entrepreneurs-in-residence and daily technical support. See schedule here. Too often in academia, students, faculty and staff with great skills and ideas get siloed off in their own disciplines. We’d like to change that. Maybe you have research you think might make a great healthcare product, but you need a software engineer. Or you want use your business, engineering, marketing or maker skills to help develop a healthcare product idea from concept to commercialization. The Innovation Studio exists to bring people together, from across campus and from the community as well. We encourage students, faculty and staff from all areas of the University to try their hands at inventing and innovating healthcare solutions together. To reward collaboration across disciplines, projects from interprofessional teams are eligible to enter competitions in which top performers will receive funding for future development. Once funding is awarded, those teams will have the opportunity to apply for additional funding cycles to help them incubate their idea. Submit an Innovation at go.osu.edu/myinnovations. Contact Tim Raderstorf, Chief Innovation Officer, at raderstorf.3@osu.edu. The Innovation Studio was made possible by a gift from an inspiring Ohio State College of Nursing alumna, Connie Hahn Sharpe (’69), and her husband Gary, who together built Health Care Logistics, Inc., a company that specializes in healthcare innovations. Read more about them here. have disclosed their invention to TCO (when applicable). Develop any product, solution or service that will help eliminate mental health stigma. Develop any product, solution or service that will improve the health and wellness of others. Collaborators will present their products, solutions or services at The Innovation Showcase on October 3rd. Top innovations will be awarded seed funding from the Innovation Studio. Teams who receive funding will be invited to subsequent Innovation Showcases to demonstrate their progress. Teams that meet set milestones and demonstrate maturation of their innovation will continue to be eligible for additional, larger grants from the Innovation Studio. To submit an innovation for the Innovation Studio, please complete the following form: go.osu.edu/myinnovations (step 1). To prepare your presentation, you should utilize the Innovation Studio Pitch Deck (step 2).